Once upon a time, online marketing was done one click at a time, usually in a rather spammy manner. As technology and the Internet itself evolved, it has become easier (and more elegant) to run a campaign of any kind, especially on social media. Still, there are marketers, entrepreneurs, marketing or PR agencies, bloggers, including the plethora of small business owners and influencers, who still use the old (read: slower) ways. At the sole mention of social media, cold sweat covers their foreheads and chills travel up their spines. Amplifr is here to help! We hope to raise the interest in super-helpful automation with this comprehensive guide. No more one-click-at-the-time, social-media-is-confusing, stress-inducing campaigns! Enter the elegant and far more efficient world of marketing for multiple social media channels. The size, richness, and probable impact of social media channels has risen above any expectancy. Hardly there’s anyone who is not aware of the power of Facebook, Twitter, Instagram, Pinterest or perhaps, Tumblr marketing and how they make businesses grow! In a crowded place such as that, not only do you need to adapt, but you need to improve and hopefully, rise above the noise. If most social media experts executed the campaigns one click of a time, they probably wouldn’t have time for anything else in their life – including the reading of this guide, which would truly be a pity. Automation of any kind, therefore, simplifies the entire process of scheduling, posting, analyzing, and then, reporting on a given social media campaign. When certain activities become easier to execute, monitor, and evaluate. Keep in mind though, that social media tools are many, containing different features and possibilities. Some of them make posting smooth and easy, but do not provide deep analytics, etc. In a bit, we’ll show you how to choose the right tool. Who can benefit the most from the use of social media automation? Any company/business that relies on social media for the growth, increased presence and ultimately, more sales. Besides the obvious time management and stress lowering benefits, the automation of your social media endeavours brings other, overall helpful consequences. There is a vast number of reasons why you should dive into social media management, scheduling, monitoring and reporting waters. It enables you to take a rest from day-in-and-day-out social media posting. Through straightforward scheduling and organizing features, the uploading of your amazing content ceases to depend on your daily activities, so you can enjoy knowing everything’s running smoothly. You’ll get all the timely statistics and insights, needed for creation and implementation of an advanced social media marketing strategy. In human-friendly words, you will be empowered to raise your social media impact and reach on a new, stronger level. Think of it this way – with scheduling, you’ll probably be posting a larger number of educational, entertaining or purely promotional content. Meaning, you could monitor the engagement, gather the stats, analyze and then, improve on your strategy with sharpened clarity. By decreasing the time waste, including the unwanted layoffs in posting, you’ll actually gain consistency. Anyone who ever got involved in social media, is well aware how important it is to maintain a steady, continuous posting habits. If your brand is not often showing up for your audience, chances are slim it’s going to become recognizable. We all know those social profiles, which occasionally post interesting, useful content, but then disappear from the radar for days or weeks. No, that is not the way to build a raving audience on social media, no matter the channel. This point is worth repeating. Imagine you are working in a public metro. Thousands of faces pass you by everyday. What are the odds of you actually remembering a face in such a crowd? Correct, you might remember someone who is extremely unusual, even grotesque. But the other possibility lies in consistency – even if the most ordinary person in the world appeared in front of your eyes for jillion times, you would probably memorize them. No, we’re not saying you should be downright ridiculous, or boring and consistent! The secret of increasing visibility on social media lies in the balance – a strategic blend of originality (creativity) and persistency. Learn that formula and your channels will be destined to grow. Surely, consistent posting is the crucial component in every successful (profitable, wide-range promotional) social media strategy. Keep in mind though, that no amount of posts, no matter how beautifully crafted, value-packed, and intelligently distributed they might be, cannot bring true results without the actual interaction. Communication, as we’re all aware, requires time and clearly, attendance. By automating the significant part of your social marketing activities, you’ll be able to respond to comments, express your gratitude for shares and retweets, also answer the messages in a timely manner. Remember that social media relies on interaction, thus a solid business-consumer relationship is a goal almost impossible to achieve without smart management (including a healthy dose of posting automation). Enter a new stage of social media marketing! Without a slightest doubt, anyone who uses social media platforms as the core element of a marketing strategy, can greatly benefit from the dedicated tools which help their management. Engagement and interaction with your brand’s fans. Furthermore, once you start managing your social media efforts in a new, advanced and by far the easiest way, the only regret you’ll have is: why did I wait for so long to try this out? Someone would say that small digital and media agencies shouldn’t have any challenges when it comes to social media marketing. After all, with talented, skilled teams and an open-minded, ultra-creative approach, agencies should rule the realm of social media with ease. Besides such solid facts, the reality is much different. Primarily because of the nature of their endeavours, which often requires their attention to be scattered across various projects at the same time, small agencies often struggle with social media. In the middle of commonly hectic schedules and the multitude of client requests, small agencies tend to struggle with social media marketing. Through the following lines, we’ll uncover some of the typical challenges they’re facing, when it comes to managing multiple social media channels (either for their own or the client’s needs). Whether the agency has a professional designer who can create original, wonderfully structured posts or not, quality content is an obligatory element of every social media strategy. When strict deadlines and demanding client requests press you down, it becomes difficult to let the creative juices freely flow. This is where an automate-oriented strategy comes to the rescue, as well-planned scheduling frees up a healthy portion of time. A liberated portion of time can nicely be used for brainstorming, drafting and perfecting all imaginable types of content – textual pieces such as articles or guest posts, images, graphics, videos, etc. Agencies routinely need to conduct a deep research about the client’s industry and niche, before even diving into content creation. What automation bring to the table is simply: less space for technicalities, and more for creativity! Oh, this one is really tricky. The challenge is to maintain the posting schedule as regular as clockwork, while you’re managing several clients and trying to fulfil their diverse needs. But mainly, the quantity of content itself announces the overwhelm. As time passes, usually there are more clients joining, while the old ones decide to expand on several social media channels for their campaigns. Posting the content one piece at the time in such a scenario would last for ages! The chances are as well, that instead of posting in high-engagement times, the content would be uploaded in “whenever I can” time, which wouldn’t bring the desired results. Just a while ago, Facebook was the absolute king of social media, especially for business promotion. Don’t get us wrong, it still is, but in the meantime, a plethora of equally promising social media platforms was developed, forcing marketing professionals to expand their efforts. Some of the examples are definitely Twitter, Instagram, Pinterest, Tumblr, with audiences growing over hundreds of millions of users worldwide. But the expansion doesn’t end there. Each and every platform can contain several profiles, representing your client’s business in a variety of ways. And as an agency, you must cover it all with equal attention. Fun, but tough work, indeed. An agency can work in full power and achieve amazing results, but if both the wins and issues are not being properly discussed with the client, the long-term progress would be almost impossible. Like any other form of communication, the one between a client and an agency representatives requires openness and directness. A continual exchange of ideas, concepts, strategies and operations is only possible if both sides acquire a positive, honest approach and most importantly, do their best to keep it that way. Undefined team delegation, and more. Especially when it comes to social media marketing endeavours, proper reporting to a client plays a vital role. Once you’ve successfully communicated the ups, downs, and blocks of a campaign, the client will most probably require the same data, but in the written form. Agencies have to make sure to think both analytically and creatively while crafting a perfect report. When done right, reporting turns into a rather enjoyable, but also deeply insightful activity. Another advantage of quality reports lies in error prevention. More on this topic in the following sections about social media reporting tools. “Who is doing what, why, when, and with whom?” could be the compressed version of daily team confusion. Keeping the track of all tasks and making sure that each client receives the deserved attention (and results), requires some serious staff organizing and management. Furthermore, a clearly outlined, strategically delegated work process often pushes the given agency from the average, up to the advanced level of productivity (therefore, success). Especially when it comes to social media management, a properly set who-does-what schedules does wonders to the strategy and its outcomes. A neverending struggle, the arch enemy of any client-focused endeavour, a deeply annoying party wrecker – the financial limit set for each campaign can surely influence its progress. In the largest number of collaborations it will be impossible to set the ideal amount of money for a campaign. Such limitations significantly influence the social media strategy, and here is where the organic approach fills in the gaps. For any social media channel, trying to build a presence and promote either your or your client’s business, organic approach takes more time, patience and strategic thinking. On the other side, it brings long-lasting results and builds relationships which can be used in many ways in the future. So, when it comes to social media, a challenge actually turns into an advantage, as limited budget can push you to more creative solutions. Once we brought the main obstacles of small agencies to light, let’s see what are the social media strategies they could use. Hopefully, these tactics will unburden at least one part of the marketing puzzle. So, is it possible for a small agency to run along with the big agencies? Keep in mind that aforementioned challenges also keep the big boys awake at night, to a certain extent. But unlike most small agencies, their resources and budget usually save the day. The time has come to discover how a small advertising agency can overcome its boundaries, focusing on social media marketing in particular. Someone would say that small agencies do not have advantages in comparison with large advertising agencies. This is not entirely true. One aspect in which the smaller agency would be a first client’s choice is the difference in approach to marketing. An independent agency is likely to follow a more personalized methods in their social media efforts. The advantage of smaller teams lies in easier team management, where professionals can swiftly jump into projects, take various creative risks, and collaborate more freely between each other. Less bureaucracy and more flexibility is definitely something many clients find valuable. Maintaining a closer, more intimate communication with the client, gaining the insight into their wishes, plans, ideas, etc. In social media marketing, smaller agencies can use all of these deep insights and information, to fine-tune the campaigns. Basically, they become empowered to turn their challenges into powers. On social media, users instinctively distinguish the generic, posted-by-a-bot posts from a carefully. Besides the benefits closely related to the agency’s size, there are certain tactics with both large and smaller advertising teams could use to master and monetize the social media channels. One strategy relates to the approach to posting. Indeed, cross-channel marketing, when done intelligently, can be a valuable asset for agencies wanting to bring the best possible results to their clients. In this form of social promotion, each and every interaction magnifies the previous one. Instead of focusing on one platform, agencies can truly leverage the possibilities of social. Another benefit of cross-channel strategy can be best described with numbers. That is right, agencies often need to operate within a rather tight budget. And when they spread their efforts onto various social channels, the reach and traffic itself pays out long-term. As a small agency, avoid sticking to a single platform by all means. Because if, for instance, the cost of advertising changes (that keeps on happening with Facebook ads), it will be easy for your to smoothly shift your marketing focus and resources to another platform. By managing several channels, you’re empowered to adapt to changes, without sacrificing the time, content, or messaging. Nice representation of “never put all your eggs in one basket”, right? Remember when we mentioned the common overwhelm most small agencies face in their work? Chances are there’s no need for you to remember those, as you’re well aware of them in your daily routine! A healthy portion of such stress-inducing situations can be soothed with a proper tracking of results (both positive and negative ones). Not to mention the reputation building, extremely crucial for small agencies. How can you stand out from your seemingly endless competition? Perfected tracking is definitely one of the ways. Whatever may be the nature of your social media campaigns, always make sure to clearly track the results. Track the results, present them, show off and be proud of that ROI! By owning your marketing wins completely, no matter how complex the ROI calculations for social media might be, a small agency both saves the money (no more blind spending on campaigns) and furthermore, enables a straightforward reporting to clients. Well alright, you know the results of every campaign, their ups and downs, overall investing data, etc. But how much does the client know? Needless to point out, client satisfaction is the main focus! Several factors determine the client happiness, true, but at the end, it all comes to this: the numbers. Luckily, we set the base properly in the previous step and now, as everything is clearly tracked, your goal as a small agency is to present that information in a best way. Is the return on investment satisfying? Furthermore, to determine the one thing every client wants to know – analyze the total revenue, including the net and gross profit, as those are the indicators of the desired positive return! After the overall strategies are set, the next step should cover the social platforms you’re going to be using. The topic of choosing the right social media channel for either your agency’s or your clients promotion is way too broad for this guide. A search such as that one depends on a variety of factors: business goals, niche, messaging, target market, and more. Use the best out of your “small is beautiful” team flexibility and personalized approach to client’s needs. Now that we got this straight, follow us as we unravel the best small agency practices for biggest social media sites! Seriously, can anyone really afford not to be on Facebook nowadays? As the ultimate overlord of social media, Facebook literally offers something for anyone. A small agency in particular, can definitely use the possibilities this giant generously provides. Whether your method of choice is a Facebook page or a group, remember that they can be used in a variety of creative ways. Think of all content types, do not limit yourself, because that is exactly what this social media powerhouse supports. Variety, variety, variety, with a ridiculously laser-focused customer persona in mind. But Facebook is not only amazing for client-customer campaigns, but also for B2B opportunities, through which you could find relevant leads for your agency. Sign up to Amplifr and connect your Facebook Pages to manage them effectively and hassle-free. There are not many social media platforms that are so suitable for ad campaign testing as Facebook. With a pretty low-cost boosting, you could make the initial, play around and testing phase, analyze the results and then, invest more in the future, larger-scale campaigns. As a client representative, you’ll have to provide high-quality visuals which are directly related to their business. For visually-based social media platforms such as Pinterest, originality plays a vital role and whenever possible, try to communicate openly with the client. Them providing images unique for their company is game-changing. Speaking of competition, keep in mind that this growing social giant is also a fantastic place for you to promote your agency in particular – advertising agencies rank pretty well in Pinterest searches. Sign up to Amplifr and connect your Pinterest Pages to see if they’re are an effective addition to your social media strategies. So, work closely with your client (s) on the content materials, creation and/or curation, and make sure to stay consistent. Pinterest has a lot to offer to agencies, do not miss out on that. Primarily, agency professionals find Twitter easy to use and monitor. Engagement is rather simple to develop and maintain on this social media platform, as a single retweet, followed with a note of gratitude could be a nice communication springboard. Successful agencies use Twitter to drive leads, grow the list, and both research and structure their strategy based on (trending) hashtags. Tweeting goes fast as a digital avalanche of information, and one of the main goals agencies have is maintain a steady posting schedule. Here, our favorite topic of social media automation tools comes in. These tools, including Amplifr, are built to make profitable posting on Twitter possible. Sign up to Amplifr and connect your Twitter Profiles to track engagement and follower count. Without a helpful dose of automation, agency talents would need to spend the majority of their already task-swamped time on posting, which is really a waste. Small agency and Instagram: How to approach it? There are two main ways in which a small advertising agency could use Instagram. The first one is finding ways to showcase your agency’s culture and main principles on social media. Another direction you can take is trying to own a service or product category, usually exploring thought leadership. Whatever the strategy, make sure to explore the vast possibilities of this, also mainly visual and highly crowded social platform. It’s no surprise that Linkedin is a primary business asset for every small agency trying to find its way on social media. After all, this enormous and certainly, unutilized platform is a great place for businesses (in this case, agencies) to connect with other businesses. Sign up to Amplifr and connect your LinkedIn Pages to receive reports on their performance weekly. A blog-like publishing space for businesses to present themselves to potential leads. How to choose the right social platform for an agency? Now that we’re aware of specific challenges most small agencies face, along with best practices they could explore on social media, it is time to briefly touch the question of platform choice. What kind of content do you already have? Which types of content suit your (your client’s) needs? How often could you post (but bare in mind that automation tools can significantly help)? Most importantly, does the platform’s audience fits into your target market? So, there are two spheres an agency has to consider when deciding on a social network. On one side, social media could be used for a client. In that case, think of their particular industry and its nuances. Also, mind the budget limits and a type of content they want/need. Otherwise, you might be searching for a social medium for a promotion of the agency itself. If that is the case, aim for large networks that mainly consist out of business accounts. For an example, the definite giant, Facebook, might be a good choice. Think of ways to connect with brands via pages or groups. Even a better option for a small agency is LinkedIn, an online kingdom of professional connections! In the case you’ve just tuned into our guides, Amplifr is highly reliable, user-friendly social media management tool. Note that there are eight more for you to read, covering everything you need to know about best social media practices! Who can find the utmost benefit in a tool such as Amplifr? In the widest sense, anyone who uses the powers of social media for professional, promotional, profitable purposes. The vast range of companies, brands, experts in the most various niches, can use Amplifr as a part of their online marketing plan. Whether your strategy is focused on driving the visitors to a site, raising the visibility online, stating an authority, or purely making more sales using social media, having smart tools like this one helps. So, which professionals would adore Amplifr’s features? And of course, marketing and PR agencies of any size. VK.com and OK.ru are supported, as truly exotic social media options. Detailed and real-results-based insights, including a clear, easily understandable reporting. Easy to use, but powerful in efficiency, Amplifr provides a needed calm and security. But, there is a reason why it is most beneficial for agencies, and small agencies in particular. We’ll happy to answer some common questions in this article, which many agency professionals asked since Amplifr is up and running. Straight to the point: Amplifr is built primarily with agencies in mind. This social media scheduling and analytics tool should be an obligatory weapon in every agency’s strategy. With it, the team members involved will always be on the same page, elegantly receiving the analytics digest via email. How many times did it happen to you – a social media campaign is running, resources are being spent, yet nobody really knows what is going on and how well the project is doing? An agency can avoid such confusion now, as Amplifr’s stats directly point to what is working for your business (or your client’s goals) and what isn’t. These traffic, but more importantly, conversion analytics pave the path to easier, smoother campaign running. No more blindfolded marketing! A cherry on the top for analytics and statistics in Amplifr: even for external posts (meaning, not scheduled via our tool), you are able to see the number of likes, comments, shares, and for Facebook, the traffic data as well. Now, we mentioned that the entire team will be on the same page with Amplifr, so let’s elaborate exactly how. When thinking about social management, we often imagine it as a one-person journey. But, this is often not the case. Within small agency teams, collaboration in each stage of the campaign is a rather regular practice. Starting from initial brainstorming, over content creation, and up to posting and managing itself, different professionals with the same goal work together. The goal is essentially simple – to make a client happy. Now, content collaboration is ridiculously intuitive on Amplifr, as everything happens inside a single platform. Easy to follow and contribute to, this social media tool’s dashboard empowers a team to run a project from various viewpoints. Amplifr’s main focus is to make an organic content work more efficient, whilst also automatically optimizing the posts for media and publications of choice. Freelance professionals – a part of the campaigns requires external talent help and you still want to manage it all inside a single platform? No problem, freelancers can have limited access, but focused around their main tasks in the social media project. Once you’ve set the roles and created the separate, access-optimized profiles for each team member, it is time to organize the project on a general level. How does Amplifr actually help in the means of workspace management? Simply, it enables you to work with multiple clients, assigned team member, and on multiple gigs at the same time! Everything flows through a single workspace. And if that doesn’t sound relieving enough, here’s something even better: social accounts can be grouped into an unlimited quantity of projects. Plus, switching between the sections and workspaces is enjoyably fast and simple. Speaking of transparency, clients can nicely monitor the entire workflow with a help of clear reporting features. Certainly, once the client has invested in an agency, no matter how much trust does he/she feels towards the creative team, one rule remains solid: the more a client is informed and optionally, involved in the agency’s work, the better for everyone. At the end of the day, we all want to sleep soundly with clear conscience, right? This is exactly why Amplifr created a kind of a workspace which empowers clients to observe, control (when and how much that’s needed) and even contribute. In such an environment, clients feel that you, as an agency, care about their input. A proper attention which Amplifr worked on, fills the imaginary (yet, rather real) gap between agencies and their clients. Such balance is also achieved like this: (we’re secretly in love with this feature, don’t tell anyone) before a relevant content or campaign is placed on social media, the client can be notified in order to check and approve the next step. There’s no need to experience any kind of gap or misunderstanding between you, as an advertising agency, and your respected (honestly, often demanding) clients. Sometimes we all miss the big picture. 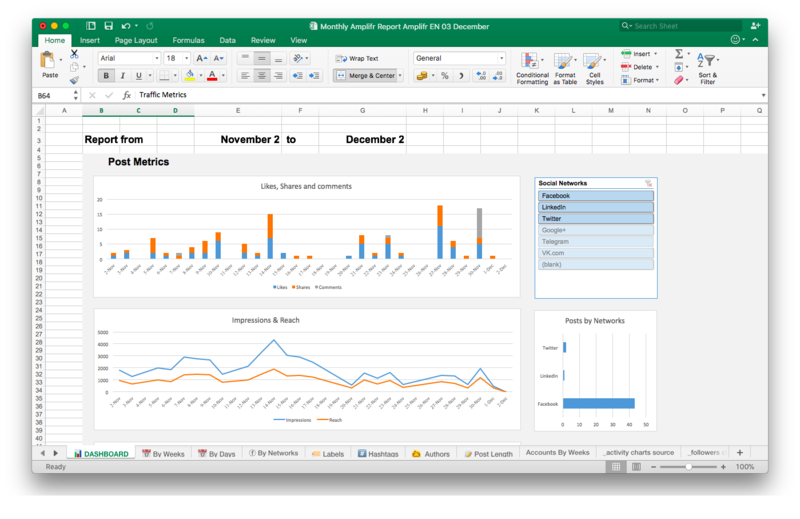 Automatic monthly reports, improved by trends and charts, bring even more value and understanding to the companies you’re working for. Working in an agency can be stressful, even overwhelming. Tasks pile up, client demands are constantly expanding (and often, changing in a blink of an eye), team members’ assignments often collide, and competition continuously lurks just behind the corner. It is no surprise that we all aim for better relationships with clients, more time, efficiency and consequently, profit. When you look at it closely, Amplifr actually helps you with all of this, in a way. By placing your creative efforts right in front of client’s sight, it strengthens your professional position. A smooth social media marketing workspace enables you to negotiate better, because each word you’ll firmly stand behind, reflects real and evident results, not mere likes or views. Think about this. Then, move from thinking into doing, results are waiting! Now that you know the benefits of social media automation in general and how Amplifr works from inside out, the moment has come to choose the right social media tool from yourself. No matter the type of business you’re aiming to promote via different social media channels, make sure to take some time before picking a perfect tool. The relieving fact that you are free to test various tools in order to see which one fits your needs the best, carries a little bit sour reality with it. To be honest – who really has time to devote months to mere experimenting with tools? You have a business to grow! With this in mind, we hand-picked the best and most popular social media scheduling and management tools on Earth, then compared each and one of them with Amplifr, so you could enjoy a brief, yet informative source pre-decision insights. Before we start our journey through top social media management tools, let’s make sure we’re all on the same page. No matter the tools and strategies you use, one approach should always remain in your focus. Also, whether you choose Facebook, Twitter, Instagram or any other social media platform for your promotional endeavours, again, this single principle should prevail. And that principle is: the content you’ll be posting must be of the highest possible quality, always! The circumstances and resources differ from one business to another, but whatever your capabilities may be – do your best with content. Provide value to your followers throughout the strategy, focus on first-rate content only, and then move on to other factors, such as timing (consistency), content adjusting according to each platform’s algorithm, etc. It feels great to set that in stone, moving on to our tool analysis now! The core of each and every social media management tool is essentially the same. They all enable you, a marketing professional or enthusiast aiming to grow a business via social media, to simplify the marketing processes. Social media tools, in short, bring clarity, order, and control into often messy marketing activities. Analytics and reporting (here, Amplifr rises above the competition, we’ll explain how). Therefore, Hootsuite is one of the most famous weapons marketers use in their social media strategies. The first and most common use of Hootsuite is certainly the scheduling: when previously prepared content is set to be posted in a specific time somewhere in the future. Scheduling on Hootsuite is rather easy, but you wouldn’t enjoy sophisticated time suggestions as on Amplifr. When it comes to teamwork, Hootsuite does offer an option to delegate tasks between colleagues. It is not as intuitive and powerful as Amplifr’s workspace, though. Both social media tools enable you to work as a team within a single dashboard, but Amplifr added analytics digests any team member can receive over email, as well as superb content collaboration features. A feature rarely encountered in social media tools is brand protection, through mention tracking and Vanity URL, an option that personalizes the links you’re using. Both of these protect your (or your client’s) company name and accordingly, reputation. Despite the richness of social channels supported and easy-to-use dashboard, the largest drawback of Hootsuite lies in its price. Especially if you’re looking for a team-friendly option, you’ll find the plans themselves costly, let alone the additional expenses for detailed reports, and similar. The deep analytics and clear reports are vital components of every social media marketing strategy. While the first one provides data insights and improves on your outcomes, the second one keeps either your bosses or clients in the loop with what (in the name of God) is happening on multiple social media campaigns! Hootsuite does offer these features, but only if your pocket is rather deep. This is why small and medium-sized businesses become empowered with Amplifr, which contains comprehensive analytics, smooth content planning and scheduling, handy reporting – but it doesn’t cost an arm and a leg per month. This tool definitely fits nicely into the new era of social media management. Once more, time-consuming operations of any social campaign are being simplified with smart software. Furthermore, with smooth processes set in place, such as posting and monitoring, you’ll have more time to improve on the social media strategy itself! Now, MeetEdgar has its pros and cons, and interestingly, is pros are its cons. Let us explain: with a goal of ultimate simplification in mind, the team behind MeetEdgar perhaps went too far. Its design, the dashboard itself, UI, everything is simple to the bone. If you’re just starting out with social media marketing, then this is the tool you’ll enjoy. But, if you do care about analytics and want to elevate your impact on social media, MeetEdgar might not be powerful enough for you. Don’t get us wrong, we respect MeedEdgar, as it is probably the most elegant, clarity-building social media tool out there. When it comes to professional (business) use, a perfect balance between simplicity and profit-encouraging features works the best. For serious marketers, PR and advertising agencies, influencers, or really any professional aiming to use social media’s possibilities to the max, a basic-level analytics MeetEdgar is offering simply won’t move the needle. First off, a revenue-growing social media marketing requires expanded presence. While MeetEdgar cover only three social websites, Amplifr went crazy with eleven of them (and counting)! Next, know that MeedEdgar is focused on evergreen content, but Amplifr supports multiple and easily monitored workflows, enabling team members to do all the work within a single platform. Finally, MeetEdgar is a dream tool for anyone who cares about organizing, simplicity, and automated features like “refill your queue”. But, what happens if you need to manage multiple channels, while including other professionals (clients, team members) into the marketing efforts? Yes, the chaos would escalate pretty quickly, which wouldn’t be the case with much more work-friendly Amplifr. Place the content into Sprout Queue, once you’ve set the schedule in advance. Here is where the first downside of this tool is met – once the content is posted on selected social media channels, your schedule list will clear out. Such organization forces you to rewrite, then reschedule the posts if you need to. Time management is a priority when you’re leading an advanced, multi-channel marketing campaign, we know. Features for team collaboration (upgraded version). As you’ve probably already noticed, the differences in features between top social media tools may seem subtle, but they’re actually game-changing. Same goes for SproutSocial – Amplifr comparisson. SproutSocial is a well-organized, wonderfully-looking tool, filled with great features. Accordingly, its price is rather high (it goes to $500 for the Team version). Here at Amplifr, we aim for both useful and affordable service (you most probably have enough costs already, no matter the business size). Speaking of teams, SproutSocial’s elegant dashboard does look amazing, as it blends all streams into one large project. Such organizational logic works fine for social media beginners or perhaps individuals like bloggers, vloggers or Instagrammers. When it comes to small teams or larger companies, one-stream interface wouldn’t be as practical. Creators of SproutSocial focused on design mainly, but also different analytics covering engagement primarily. These features can certainly help out in the social media marketing beginning. Do they move the needle, business-wise? Not really. This social media management tool is great if you have large marketing budgets. Also, if your aesthetic requirements are high, and your goals based on social media popularity, then SproutSocial might be for you. What if you want more from social media? Whether you’re a complete social media newbie or an experienced professional, Amplifr offers a clear platform, but with deeper data insights than SproutSocial. Furthermore, it’s focused on money-making analytics – traffic and conversion data. It’s a pity to invest an immense amount of effort (time and resources) into social media marketing, and still don’t move beyond mere engagement stats. The true benefits of social media lie in both engagement and conversions, and Amplifr definitely empowers any business user to reach those new heights. Our last contestant is probably the most popular social media management tool right now. The same basic principles apply to Buffer, as they do for aforementioned tools. If you aim for utmost success on social media, merely posting of high-quality content every day won’t make a significant difference to the traffic, not your revenue stats. When super-useful social media tools such as Buffer and Amplifr come into play, they help you manage multiple social channels, while showing exactly when, how, and how often you should post. By automating social media marketing efforts, it turns from nerve-wracking and overwhelming into fun and profitable activity. And who doesn’t want to reach more potential customers and raise the brand awareness – in less time and with strategic effort? Two team members could work within the account (premium version only). Buffer is highly popular, especially because of its user-friendly dashboard. It can help you drive traffic to your site and offers, possibly improve the engagement, and other tools we mentioned, to save a lot of time. In our honest opinion, the major downside of Buffer hides in its simplicity, but also, a fact that all business-growing features are extremely expensive (for deeper analytics and smoother management experience, one needs to pay $200+ per month). Let’s begin with visibility, where the number of supported channels plays an important role. While Buffer covers only five social media sites, Amplifr doubled that number. As we all know, wider social media presence is a serious business advantage. Buffer doesn’t notify you like Amplifr does: when an entire day passed without posting or certain metrics need your attention. Remember, a balanced mix of highest possible quality and consistency counts. Now you completely comprehend the upsides and downsides of Buffer. Keep in mind that it is a tool which can work rather nicely for content creators, curators, anyone who wishes to become more popular on social media in less time. Still, you’ve noticed that none of these top world’s social media tools doesn’t even come close to Amplifr, when a topic of growing a business emerges! Because in its essence, Amplifr combines the visibility-boosting features, complemented with practical data and reporting to propel your sales forward. Having a reliable social media management tool by your side, vastly simplifies (and accelerates) the entire spectrum of marketing steps. See Amplifr as your faithful sidekick on a journey to fully successful, money-making, influential social presence. That’s why it was built in the first place – to help you reach all your goals on social media (and more)! In essence, it simplifies the entire process of scheduling, posting, analyzing, and then, reporting on a conducted social media campaign. Simply said, it simplifies the life of any marketing professional who wants to grow the presence, impact and income on social media platforms. Creation of eye-opening reports which inform everyone involved in campaign’s results. 5. Agencies, whatever may be the nature of your social media campaigns, always make sure to clearly track the results. Track them, present them, show off and be proud of that social media ROI! Keep testing and optimizing your strategy, while constantly referring to the performance data to see what works and what doesn’t. Freelance professionals – freelancers can have limited access, but focused around their main tasks in the social media project. No matter the tools and strategies you use, one approach should always remain in your focus: the content you’ll be posting must be of the highest possible quality, always! The true benefits of social media lie in both engagement and conversions, and Amplifr definitely empowers any business user to reach the new heights!